I have told you that my father-in-law, Bob, makes the best baked beans I have ever had. Better than any restaurant around. 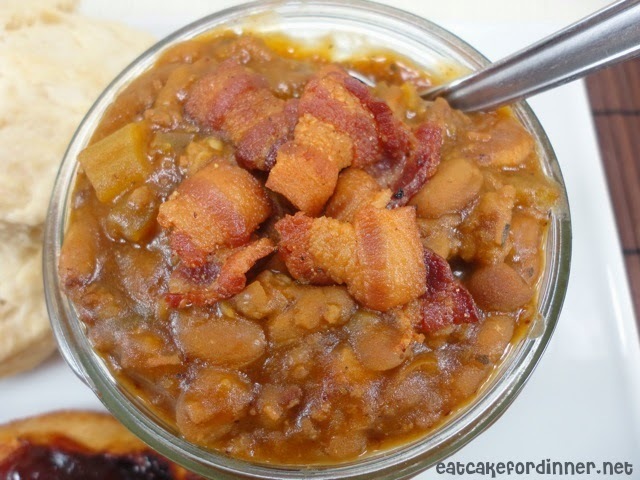 I didn't even like baked beans until I tried his recipe and now I love them. I am on a constant search to find a bean recipe as good as his. I found a promising recipe a few weeks ago. It comes from The Daily Smash and she says it is her Mom's recipe and she has never found another recipe she likes as much. I even noticed one of the comments said that they couldn't believe she shared her Mom's yummy recipe! I thought these beans were absolutely delicious. 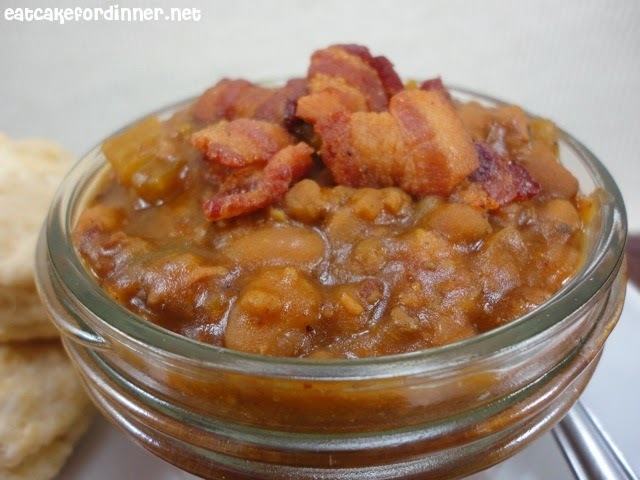 I used a different brand of baked beans than I usually use and I think it made a big difference in the taste. The flavor did remind me of Bob's, so I am getting closer! Fry bacon and set aside. Brown ground beef, onion and celery in a large pot and cook until vegetables are tender. Dissolve the bouillon cubes in water and add along with the remaining ingredients, including the cooked bacon. Mix well. Cover and bake 1 hour @ 375 degrees. Top with sour cream. This freezes well. Jenn's Notes: I cut the recipe in half and I used one can of Country Style flavored beans. I also added some diced green bell pepper. Next time, I will try adding some sausage! Instead of baking this, I just let it simmer on the stove for a few hours. This recipe was so good. Im so glad that you liked them. They are my all time favorite :)Thanks for the shout out .. Love your blog have a great weekend. These look great. I make home-made baked beans all the time but I always use navy beans, soak them overnight and bake with all the ingredients for seven hours. won't your father-in-law share his recipe with you? Not yet - it's top secret :) I'm working on it though!